A tsunami warning has been issued after a massive 7.6 magnitude earthquake struck in the Pacific Ocean off Australia’s east coast. The Pacific Tsunami Warning Centre said tsunami waves could hit areas close to the French territory of New Caledonia, about 1,400km off Australia’s coast. The undersea quake stuck on Wednesday at about 10km deep and 155km south-east of the Loyalty Islands off New Caledonia’s east coast. 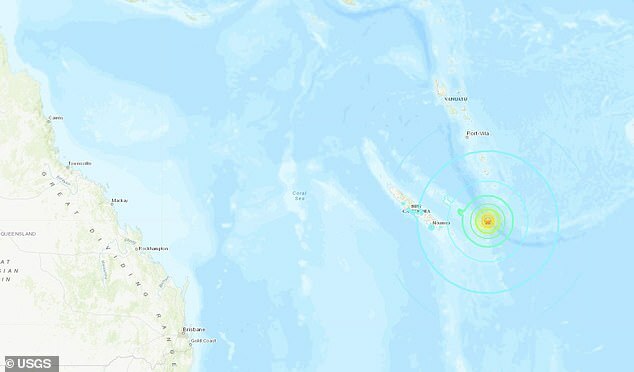 ‘Hazardous tsunami waves from this earthquake are possible within 1,000km of the epicenter along the coasts of Vanuatu and New Caledonia,’ the PTWC said. There were no reports of immediate damage, injuries or casualties.